Our first techdemo release is finally available for Linux, Mac and Win32! 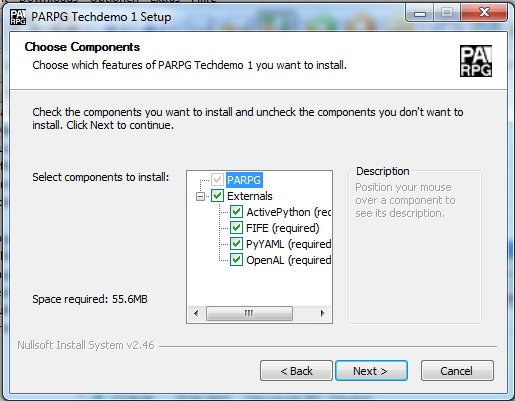 This release is based on PARPG SVN trunk revison 522. Built against and tested with FIFE SVN trunk revision 3236. This preamble has been written to give you an upfront overview of the current status of the project. In the last months the project slowed down considerably and we basically decided that we’ll rather release what we have right now instead of trying to implement more features and add more content, risking to collapse before we reach the finish line of the first release. This said: we didn’t manage to fix a number of bugs and didn’t reach the original aim to implement a couple of quests that you can actually play through. You can walk around, talk to other characters, change to different (placeholder) maps, listen to background audio tracks and play around with the settings. That’s it. It’s possible that this is the first and last official PARPG release due the issues we are facing lately. Hopefully this release will help to attract some fresh blood that will get the project back on track. If not, it was at least fun for us to spend a year of our life on such a project and release what we have achieved to the public. And move on after that. This entry was posted on Wednesday, March 10th, 2010, 22:09 and is filed under Misc. You can follow any responses to this entry through RSS 2.0. You can leave a response, or trackback from your own site. So… how about a summary of what this release represents? A release announcement needs to be more than a few download links & a readme. This is not going to be compelling for anybody who is not incredibly curious by nature. “This release is the result of X years of work by Y contributors. Whilst it is just a tech demo, it provides the foundations, including FOO FEATURES from which contributors can do BAR ACTIONS. That would be an announcement..
At the end of the day somebody has to write it though. I should be taking a break from PARPG right now but as nobody else was around to coordinate the release, I had to temporarily step up again. might explain what and where they are for the noobs. The Win32 installer offers to install them for you if you haven’t installed them yet. I somehow doubt that non tech savvy users are really interested in all the details, they rather simply want to test the game. It works! Any way to run it in 800×600? Didn’t on my install, or I missed it. We had some reports, that sometimes some dependencies don’t get installed by the installer despite that they’re checked in the installer menu. We were not able to confirm these reports yet. In case that happened to you, let us know which Windows version you’re running (XP, Vista or 7) and if it’s either the 32 or the 64bit version of it.